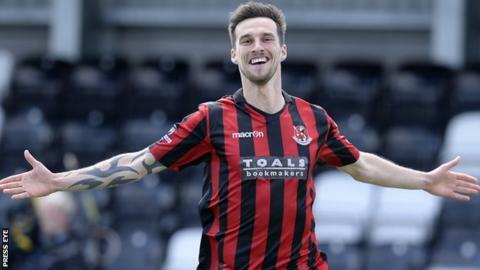 Crusaders will start their defence of the Premiership title without Declan Caddell after he broke a foot bone in the Charity Shield defeat by Glentoran. The midfielder could be sidelined for up to two months with a broken metatarsal in his left foot. Caddell was a key player for the Crues last season as they secured the title for the first time in 18 years. Striker Michael Carvill is also out for at least three weeks after injuring an ankle in a friendly last week. Crusaders begin the campaign against Portadown at Seaview on Saturday. A second-half strike from Jordan Stewart gave the Glens victory in Saturday's Charity Shield encounter at Solitude. Caddell conceded a penalty when he dragged down Steven Gordon but Jay Magee dragged the spot-kick wide.